Wendy Tsung, associate dean, leading the EMBA Program team conducting the Fort McClellan Leader’s Reaction Course. 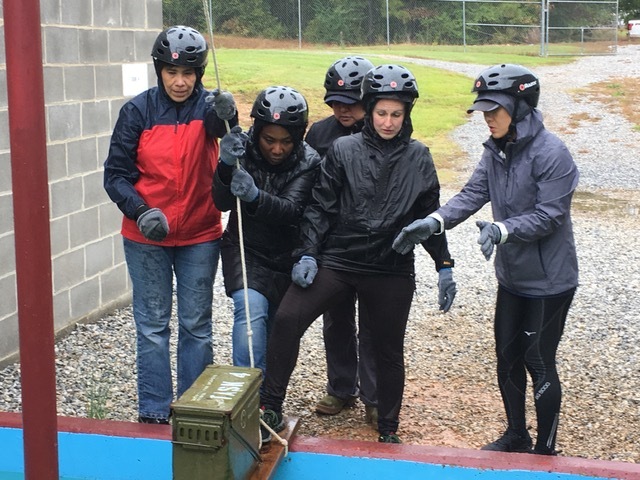 On an early morning in late October, several students, faculty and staff gathered in the cold and rain to put their leadership skills to the test. However, the inclement weather was not going to hinder our successful completion of the 15th Leader’s Reaction Course. The Leader’s Reaction Course is a unique experiential leadership opportunity offered to Goizueta selected BBA and MBA students that builds upon the programs and facilities of the U.S. Army for developing leadership. The one-day leadership challenge, managed by retired U.S. Army Lt. Gen. Ken Keen, associate dean for Leadership Development at Goizueta, is a hands-on experience that emphasizes learning through team-based problem solving, decision making and effective communication skills. WEMBA, or Weekend/Modular Executive, students participated in the day’s activities, which started by heading to Alabama by 8:45 a.m. The students formed into small teams, overcame challenges, surmounted physical barriers, established plans of action and executed their plan to solve a problem. After each event, the participants executed an after-action review to discuss what went right, what went wrong and what needed to be improved. Through this feedback process and reflection, students apply their lessons in subsequent challenges, which is exactly what business professionals do in business settings. This was a great learning experience for the students in understanding their leadership style and a take on problem solving in a unique creative manner with the help of their team members. Shweta Sehgal is the program research assistant in the Leadership Development Program at Goizueta Business School. Sehgal is an experienced research associate with a demonstrated history of working in the higher education industry. She is skilled in higher education research, lecturing, curriculum development, organizational leadership and teacher training. She is a strong research professional with a Doctor of Philosophy (Ph.D.) in Psychology. Professor Tom Smith talks with 11Alive about some of the contributors to Atlanta's booming population. Accounting professor Usha Rackliffe discusses corporate taxes and how some big names won't pay... legally. Associate Professor of Marketing Ryan Hamilton and his co-author, Uma R. Karmarkar, received best paper honors for their work on consumers and decision making. Structured for working professionals, the Evening MBA features offerings you expect from a full-time MBA delivered in a flexible, weeknight schedule. Ranked No. 1 in Atlanta and featuring an innovative curriculum taught by world-class faculty, our program gives you the edge and connections you need to succeed in our dynamic marketplace. Accelerate your career or explore new fields using the outstanding knowledge and accessible network you gain as an Emory Evening MBA. The Weekend MBA for Executives offers strategic thinking skills and immersive short courses and helps you establish your expertise through areas of focus. Delivering a business-friendly schedule, dedicated career services and the flexibility to choose your concentration, we are designed for every high potential professional ready to take their career to the next level. The Modular MBA for Executives program fortifies you with a unique, blended teaching method. Providing flexibility through online learning, we deliver a rigorous and relevant education made manageable for busy executives. It also reinforces accountability -- to your classmates as well as yourself -- through robust, week-long classroom experiences held on-campus quarterly.